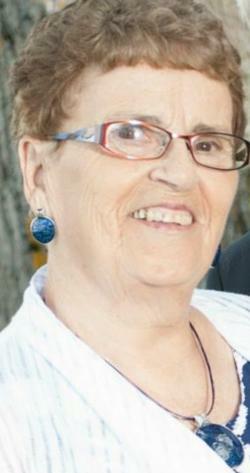 The death occurred at the Western Hospital, Alberton, on Tuesday, August 14, 2018, with her loving family by her side, of Ruth Frances Kenny, beloved wife of John M. Kenny of Alberton, age 78 years. Born at Christopher's Cross, PEI, on May 12, 1940. She was the daughter of the late Fred and Esther (nee Handrahan) Harper. Loving mother of Michelle (Trent) Arsenault of Duvar and Sue Anne (Dale) McInnis of Cochrane, Alta., and Danny (deceased 1987). Cherished grandmother to Elora (Michael) Arbing, Emily Arsenault, Samuel Arsenault, Aidan McInnis, Abigail McInnis and Danny McInnis. Dear sister to David (Lois) of Tignish, Wendell (late Josie) of St. Catherine's, Alice (Richard) Ellsworth of Christopher's Cross, Philip (Muriel) of Christopher's Cross, Nancy (Shane) Rochford of Summerside, Freda Hardy (late Doug) of Alberton, Bobby (Penny) of St. Catherine's, Molly (Derryl) Buote of Anglo, Edward (Darlene) of Clyde River, Joe (Patsy) of Tignish, and Rose Mary (George) Terry of North Bay, Ont. Also survived by sisters and brothers-in-law, Claire (Bob) Groombridge of Thunder Bay, Ont., Pat of St. Felix, Terry (Gladys) of Waterford, June (late Ernest) Waterson of St. Felix, Joe (Shirley) of Tignish, Barbara (Stewart) MacRae of Point Prim, Philip (deceased) (Wilhelmina) of Northport, Jean (Dave) Willcock of Palmer Road, and Richard (deceased). She will be sadly missed by her uncles, aunts, nieces, nephews, cousins and friends. Resting at the Rooney Funeral Home and Chapel, Alberton. Visiting hours Friday, 2:00 to 4:00 and 7:00 to 9:00 p.m. Funeral Saturday morning from the Sacred Heart Church, Alberton, for funeral mass at 10:30 a.m., Rev. Andrew MacDonald, Celebrant. Interment will take place in the Church Cemetery. As an expression of sympathy, memorials to the West Prince Caring Cupboard would be gratefully appreciated. Sacred Heart Church, Alberton, P.E.I.